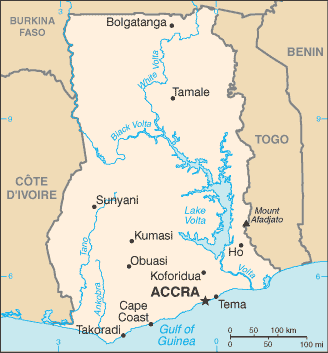 Ghana, officially the Republic of Ghana, is a sovereign state located on the Gulf of Guinea and Atlantic Ocean in West Africa. It is bordered by the Ivory Coast to the west, Burkina Faso to the north, Togo to the east and the Gulf of Guinea and Atlantic Ocean to the south. The word Ghana means "Warrior King".